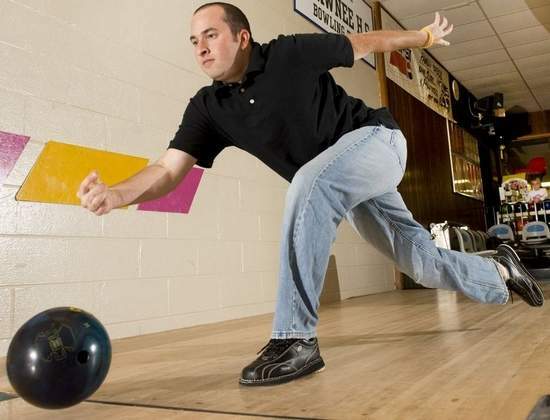 In September when Andrew Teall’s father Tom required knee surgery, Andrew stepped in and took his dad’s place on his local bowling team, Wipeout, in the Monday Night Invitational League at Medford Lanes in Medford, NJ. This past Monday, at his final frame, Teall reached his arm back, and rocketed the ball down the lane, STRIKE. Not in itself that exciting, except when you consider that throw was his 36th consecutive strike, making him the 15th sanctioned person to roll a perfect 900 series, scoring three straight 300s. “It’s somewhat comparable to a perfect game in baseball where 27 batters come up and all go down,” said Mark Miller, corporate communications manager for the United States Bowling Congress, the governing body for bowling in the US. In recorded bowling history there has been a grand total of 21 900 series in 114 years. “There was a big crowd that kept growing and by the time the 10th frame hit, the place was packed,” said Dave DeSantis, vice president of the South Jersey Bowling Association. “It was actually very surreal and to be honest, I wasn’t nervous,” said Teall, who has been bowling competitively since he was a high school freshman. I had bowled 300 (five times) before but never twice in a row. When I got halfway through the second game, I actually thought I could do two in a row and when I did, it was an unbelievable feeling. Then the third game, it just came and went. Amazingly, despite the rarity of a true 900 series, the previous one was done just 3 days before Teall did his, by Chris Aker in Winnermucca, Nevada. Just because his son rolled a perfect series though doesn’t mean Tom intends to sit out the rest of the year, “I’m hoping to get back sooner than later and I think that once I’m able to bowl that he’ll take some time off,” said Tom Teall. This guy’s no Jip Winfrey.